Sima Truuvert was a well-known and highly regarded urban planner. She was Randwick City Council’s Director City Planning and worked for Council from 1998 to 2018 and prior to this worked for the Department of Planning for 15 years. An international woman, Sima demonstrated that planning is about people and about creating a sense of community. She helped oversee a number of urban renewal programs including the Bundock St site in Randwick and the Prince Henry redevelopment in Little Bay. Her work helped Council win the prestigious Banksia Environmental Award for Local Government and two International Liveable Communities Awards. In 2017 she received an Australia Day Mayor’s Award and in 2014 she received a Minister for Local Government Award for Women – recognising her substantial commitment across local government. Sadly, Sima passed away in early 2019. She was much loved by the staff and Mayors and Councillors of Randwick and known and admired by many in the community. 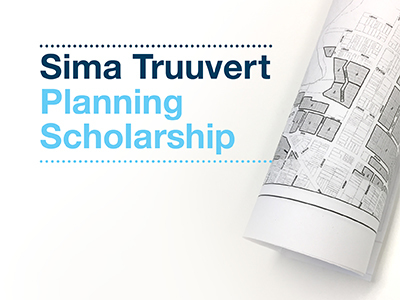 The Sima Truuvert Planning Scholarship was announced in 2018 and established in 2019 to inspire and encourage the planners of tomorrow to shape our City and plan for our residents' lifestyles. Randwick City Council is proud to offer student planners in their final year of study or recent graduated planners the opportunity to work full-time in a leading Sydney Council. Located in the vibrant eastern suburbs with plenty of interesting planning projects, this opportunity will offer the scholarship winner a great start to their career through direct involvement in a variety of responsibilities and duties undertaken by Council’s Strategic Planning team. Applications for the scholarship are sought in the first quarter of each year. The scholarship is advertised through Council’s jobs web page, online and through our various communication channels. Applicants should submit their entries online. Demonstrate excellence and / or commitment to planning and its role in building stronger communities. A basic understanding of the functions and aims of the Environmental Planning and Assessment Act 1979. Familiarity with the role of a planning and building division within local government. Basic research and critical analysis skills preferably in land use and transport planning, social planning or urban design. Ability to manage multi task workloads, deadlines and projects. Ability to communicate effectively with people. Demonstrated commitment to EEO, WHS and the principles for a culturally diverse society. Applicants must include a statement demonstrating how they meet the essential criteria listed in the position description, to be considered for this role. This scholarship is offered for the first time in 2019. It is a perpetual scholarship. View the scholarship information and position description on Council's Current Vacancies page (available only during application period) or contact the Coordinator Strategic Planning, on 02 9399 6961.